We now find ourselves in October, the good summer is but a memory, the dark nights are coming, however we still find a bit of sunshine during the long nights as our Guilds start up and we share in the fellowship that we all find in meeting together, weekly, fortnightly or whenever! October also makes us think of harvest, we display our harvest tables and thank God for the gifts that he provides, the seeds planted and how they grow into wonderful crops that supply us with most of our needs. This reminds me too of the seeds that we as Guild members have planted in the minds of those who have not yet experienced the friendship and support that comes from being a Guild member and we pray that these seeds will grow and our membership will grow in the session ahead......especially with our offer of one year’s free membership!!! To those who meet over the summer months we hope you have had a good session and to those just starting we pray that the winter may be kind to us as we look forward to many friendly and happy Guild nights together. 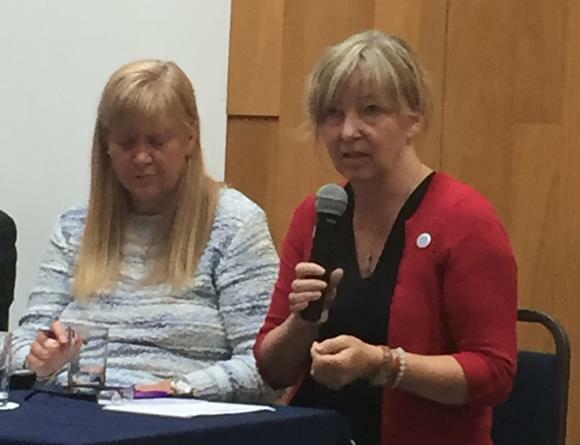 The Guild was well represented at a Church of Scotland World Mission Council conference and round table discussion last month focussing on how we can live together in a world of religions. There were speakers from India, Pakistan, Jamaica, Egypt, Ghana, Sri Lanka and Croatia. Each speaker brought their own thoughtful insights into how people of different faiths can live together and shared stories from the various types of work they were involved in within their own country. It was both challenging and inspiring in equal measure. Is there a group of women from another faith that you could meet with to learn more about each other’s faith and how together you can serve your local community? You're in for a big suprise! If you had gone to Scalloway Guild you would have been in for a big surprise as the Guild joined forces with the local brownies for a Teddy Bears picnic! And what fabulous teddies everyone was able to bring along. Everyone had a fabulous time with lots of fun and laughter not to mention delicious cake! Could you try something like this with children in your community? Duntocher are 'floored' by beauty! 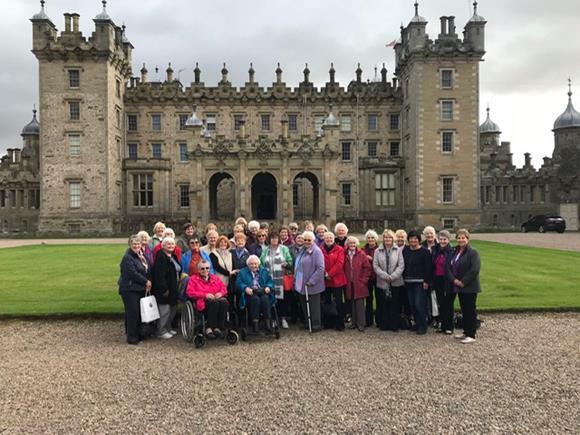 Members and friends of Duntocher Guild organised a few days away in the Borders recently. There were 'floored' by the beauty of the the area including the splendid Floors Castle near Kelso. It was a great opportunity for everyone to get to know each other better and share in fun and fellowship. Is this an adventure you could think about for your Guild or Guilds Together grouping? 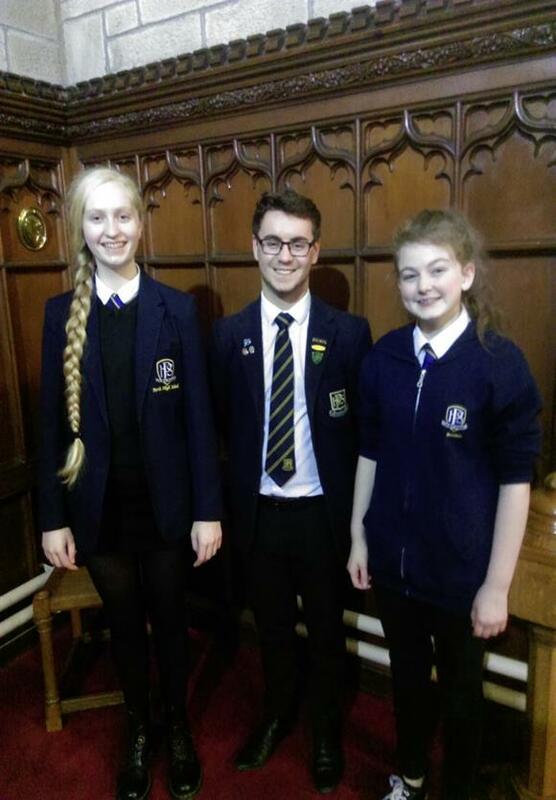 Amelia, Fraser and Heather visited Lower Earn Churches Together Guild meeting recently to talk about their busy, extra-curricular lives. The evening was organised to highlight the Churches involvement with YOYP 2018, and to bring about a better understanding throughout all generations. Amelia talked about YPI and her involvement with the Cycling without Age project, Fraser, on his involvement with the Scottish Youth Parliament and the National Youth Choir of Scotland, and Heather, on her involvement with the National Youth Orchestra of Scotland and being involved with the School Chaplaincy Team. They are all also heavily involved with lots of Perth High School’s extra-curricular music groups. Members were impressed by their superb confidence, professionalism, turnout and wonderful attitude to life. One member said that it was "most inspiring to hear and see young people in such a different way." One of the themes of YOYP 2018 is participation-these young people most certainly tick all the boxes! Maybe you could invite some young people from your church or community to a Guild meeting to share what they are doing and in turn let them experience the fun, faith and fellowship of the Guild. 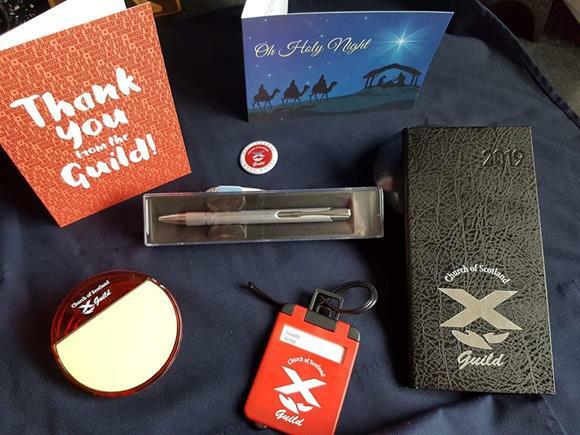 We continue to have a great range of merchandise available in the Guild shop including our very popular diaries and Christmas cards. We also have tartan to buy by the half meter and our brand new navy double oven glove, great value at £6.50. In addition we have our silver earrings (£75), pendant (£85) and a new edition of a charm (£38). Order these now to be sure to have them for Christmas. Why not order a shop on sale or return from the Guild office for your next event or meeting? Email guild@churchofscotland.org.uk to place an order. 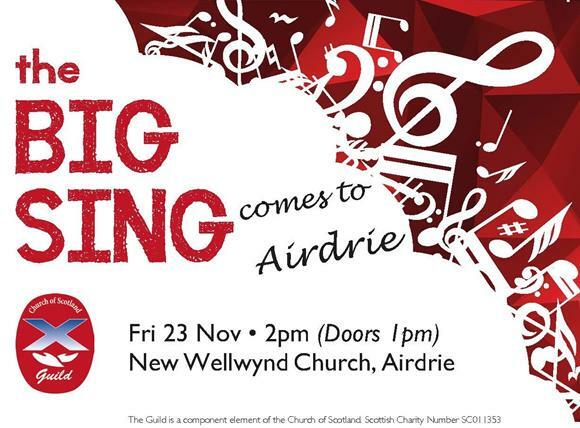 We are hoping you all find your way to Airdrie this Guild week to join us for the Big Sing. Ticket applications were sent out to Guilds in the September and already a significant number have come in! Be sure to send back your application soon to ensure that you don't miss out in what promises to be a great day! 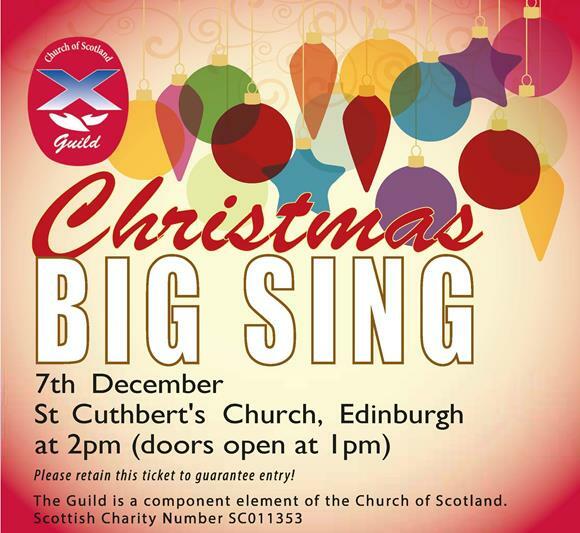 Many of you joined us last year for one of our two 'sittings' of our Christmas Big Sing! This year we are in Edinburgh and are using a bigger venue, of course the challenge is whether or not we need a second sitting this year! It is a lovely way to start your Advent season so why not come and make a day of it with a bite to eat and a visit to the Christmas market. Again application forms are in the September making, we hope to see you there. 5 Oct giving thanks for all teachers in our schools, colleges and universities who support their students to be the best that they can. 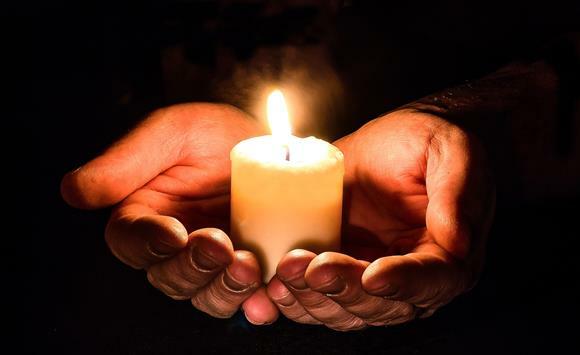 6 Oct especially for all affected by the Indonesian tsunami, that they may know peace even in the turmoil that surrounds them. 7 Oct remembering Mabel Sitchali working again in Zambia. Giving thanks for all that she added to our Annual Gathering. 8 Oct for immediate past convenr Marge Paterson as she speaks to St Mary’s Guild in Motherwell . 9 Oct remembering emergency service staff supporting the survivors of the Indonesian tsunami. 10 Oct thinking of people who struggle with mental ill health, asking that they will fund the support and strength they need to be well again. 11 Oct on International day of the girl child, for adolescent girls entering the workforce, more than 90% whom live in developing countries and will work in the informal sector, where low or no pay, abuse and exploitation are common. Pray that steps will be taken to ensure they receive the education and training they need to improve their employment opportunities and countries act to end discrimination and exploitation. 12 Oct for the safety of all the Project speakers as they travel across Scotland to visit the Guilds as the dark nights and storms of autumn arrive. 13 Oct for Boys’ Brigade members starting out on their Queen’s Badge course, that they will learn new skills, support their community and grow in faith. 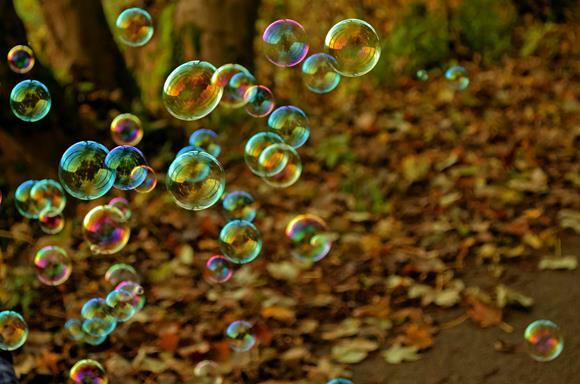 14 Oct thinking especially of people who have found this weekend difficult because they feel lonely and alone. Pray that God will draw close to them. 15 Oct for women living in rural areas all over the world who are disportinally affected by poverty. Pray that climate resistent agricultural practices will be available to women as easily as men and that security of land tenure will be a reality for all. 16 Oct thinking especiallly of people involved in trying to end hunger by 2030. Pray that we will do all that we can in our own lives to help with that aim by wasting less, eating better and adopting a sustainable lifestyle to help build a world free of hunger. Help us understand that the choices we make today are vital for a secure future of food. 17 Oct remembering all those who work on large ships, that they may feel at home whilst they are in Scottish ports. 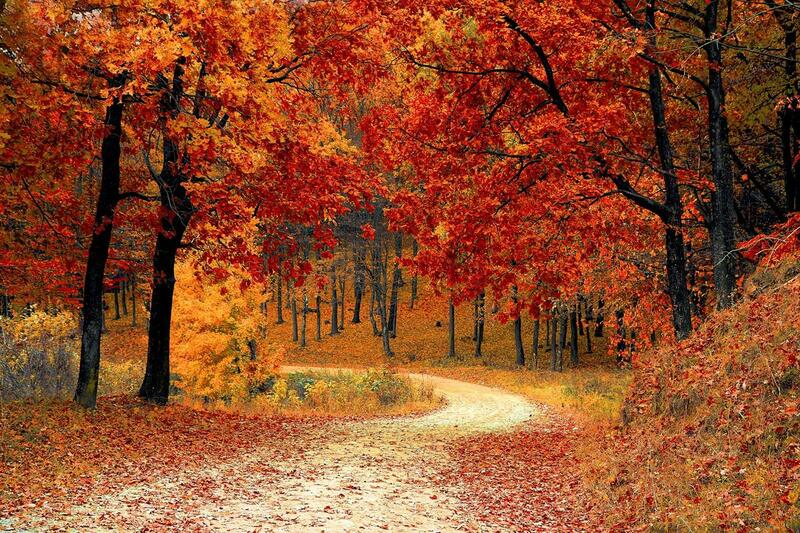 18 Oct remembering all who are cared for in nursing homes, that they may find contentment and good company. 19 Oct thinking of the 100 children sleeping rough on the streets of Pune’s red-light district. Please pray that as our partnership with the Free to Live Trust develops we will be able to rescue many of them. 20 Oct for the girls who have been selected to be part of the teenage mothers project in Zambia, that God will be preparing them for all that the project can offer them. 21 Oct remembering the members of the Special Commission of the General Assembly as they begin their deliberations regarding the future shape of the church. Pray that God will give them wisdom and discernment. 22 Oct for all attending the Guild roadshow in Arbroath, that folk will be encouraged and supported. 23 Oct for all attending the Guild roadshow in Forfar, that folk will be encouraged and supported. 24 Oct for all attending the Guild roadshow in Fraserburgh, that folk will be encouraged and supported. 25 Oct for all attending the Guild roadshow in Stonehaven, that folk will be encouraged and supported. 26 Oct thinking of those involved in planning the Big Sing in Airdrie as they visit New Wellwynd to make final arrangements. 27 Oct thanking God for the staff of CrossReach as they support people in so many varied ways across Scotland. 28 Oct remembering National Convener, Patricia Robertson as she represents the Guild at various events across the country. 29 Oct for young people struggling with an eating disorder, that they may find help and support when they need it to enable them to live a full life. 30 Oct remembering Tamsin Dingwall, NYA Moderator, as she speaks at churches and Guilds across Scotland. Thank God for her faith and vibrancy and for what she added to our Annual Gathering. 31 Oct for the work of the Church and Society Council, and their work taking issues to politicians across Scotland. 1 Nov thinking of young farmers in Malawi as they prepare their ground for planting and wait for the rains. 2 Nov especially for women who have been victims of domestic violence, that they may find the strength to move out of their abusive situation to a place of safety. What is the capital city of Zambia? The winner is Janice Kennedy of Coatbridge. Congratulations Janice, your prize will be on its way to you soon. This month's question is: When is the international day of the girl child? Answers to Guild Office by 26 October for your chance to win some Guild goodies! When our heads go down and our shoulders droop: Lift our eyes that they may look into yours and see there a love that will not ever let us go. Well, that's everything for October's edition of Guild e-news! If you have something to contribute for the next e-newsletter, then please email guild@churchofscotland.org.uk <mailto:guild@churchofscotland.org.uk?subject=e-newsletter%20contribution> - we can't wait to hear from you!